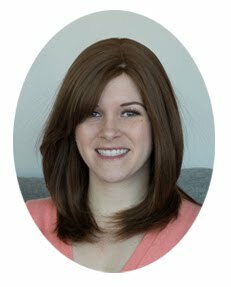 Waffling: Audrey and Gem Giveaway! Halloween is over, which means it is time to start counting down the days until Christmas (at least up here in Canada where Thanksgiving is a distant memory). It can be hard to shop for some family and friends who seem to have everything. Well that is where Etsy comes in handy! Lots of amazing handmade products that are unique and awesome- just like the people you are buying for. I have bought a few prints and trinkets off of Etsy before and I have always been impressed by the sellers and the quality of the items I have received. What I love most about it is all the options for customization that some sellers offer- you can often add names and dates to prints and pick your own colours. You would be hard pressed to find something that won't fit with someone's decor. Enter Audrey and Gem! Gemma from The Sweetest Digs runs an awesome Etsy shop called Audrey and Gem with tons of different prints, many of which are customizable for that special person in your life. And you know what is even more awesome? Gemma is offering 2 prints for FREE to a lucky reader!!! I know right?? Isn't she awesome? Contest details are at the bottom of this post, but I want to gush about her prints first! I think my favourites would be the I Love Canada one and the pink moose! YOU'RE DAMN RIGHT I'M PARTICIPATING!!! And yeah, that tweet totally happened. ALL THE #HASHTAGS. And here's my second comment to say I totes twittered this up. I would love the 'i love canada' print! I would put it on my hallway display shelves, as well as the so loved chalkboard print that would go in my little guys room! 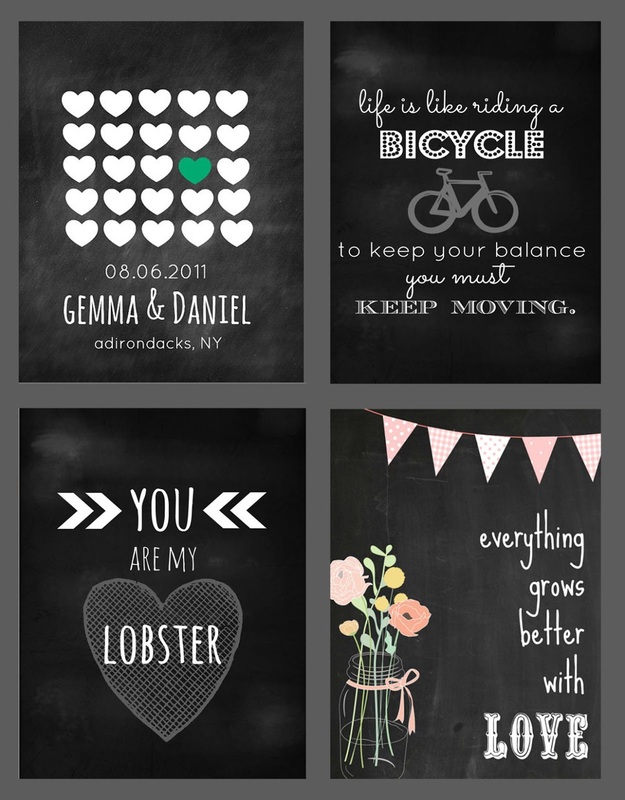 My faves are the "I Love Michigan" watercolor and the mason jar chalkboard one. I would choose the "Love who you are - Owl print" and the "turquoise Be Brave print". The be brave print I would put somewhere central where I would see it often, I'm thinking my kitchen. And the love who you are one I would put in our bathroom or the guestroom. I'm in love with the I Love Canada watercolour. and the LOVE watercolour print I think - hard to choose though! Her stuff is all gorgeous! And I tweeted! Great giveaway, thanks for hosting. My favorites are the I Love Canada (because you know I do!) and the poppies watercolor print. love love love the Love Canada map print and the LOVE water colour print! these are gorgeous! love the "let's be adventurers" chalkboard print! (would totally go in our bedroom) and the "i love nova scotia" water colour, of course ;) awesome giveaway, ladies! I too love the maps! We are moving in the spring and would love some new regional flair! My son is currently obsessed with elephants, so that is the other I would choose. love these! 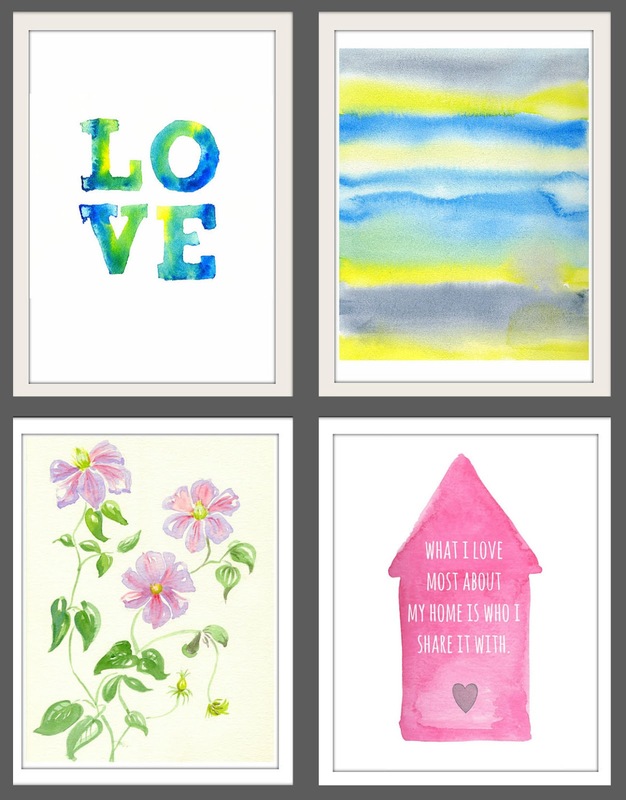 Ooo my favorites are the Owl one you posted and the Maryland water color! I would choose "I Love Minnesota" and "The Sweet Moose" prints. 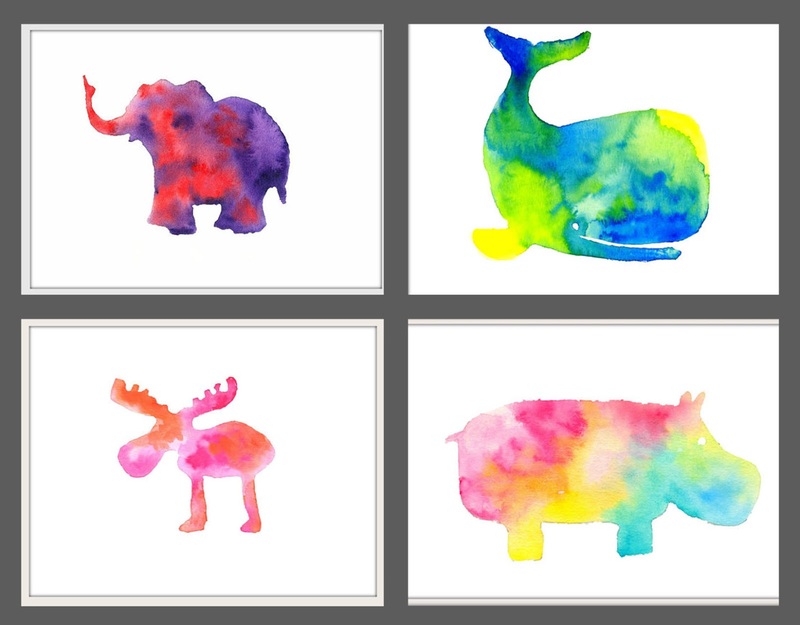 I would choose the moose prints! in both colours! I have wanted to get one of her prints for awhile, just havent pulled the trigger. 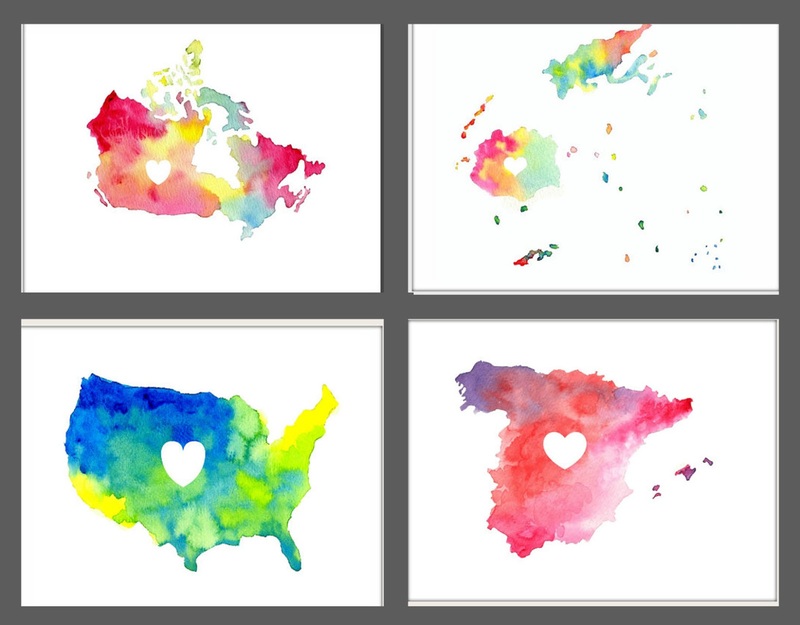 I would love the watercolor Canada one and the watercolor LOVE print! So pretty! I LOVE the blue/green I love Canada watercolour... you know Johnny would too! ;) It would totally hang in our kitchen. The "let's be adventurers" chalkboard print would be a pretty sweet entry way piece to encourage a few outdoor escapades!